Soy sauce chicken is a traditional Chinese cuisine dish made of chicken which is cooked using soy sauce. Soy chicken is a simple dish which can be whipped up in just 30 minutes. This is a staple dish found in China town and around the world. This Chinese meal is a juicy, tender and glossy chicken recipe which is served along with rice plates. Here i just adapted this recipe to make crispy chicken snacks or dry chicken recipes. An Indian recipe for soy sauce chicken or crispy chicken. 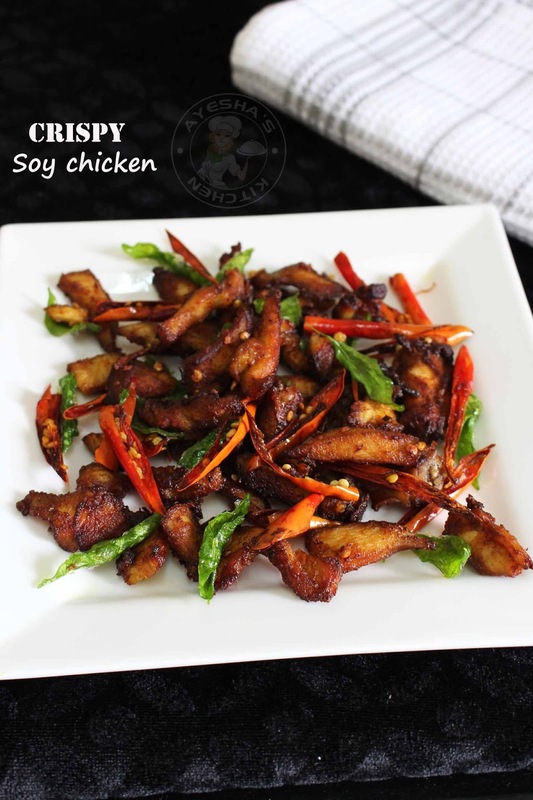 This crispy soy chicken is utterly delicious with juicy tender meat and a crispy coating. No doubt, this chicken snack is sure to be a crowd pleaser. Whenever i make chilli chicken or saucy chicken at home, i just keep a portion of fried chicken strips aside for my kids as they love to snack these fried chicken strips as its own. So i thought of making some snacks with chicken strips for my kids. By marinating the chicken with soy sauce and garlic powder or garlic paste, the chicken strips will be well flavored. The use of corn flour gives this chicken dish a crispy crust. More over this chicken has a mouth watering flavor. And the reason is just simple. Fry some sliced green chilies and curry leaves just before frying the marinated chicken strips, which gives a special inviting flavor to the whole chicken dish. So just try this best chicken strips recipe for your kids as they love simple chicken recipes to the core. Totally less time consuming, less messy and with few ingredients chicken recipe. So lets see how to make crispy chicken / easy soy sauce chicken / fried chicken strips recipe /recipe for chicken strips/ dry chicken etc. Make thin chicken strips and pat dry. set aside. Marinate with all the given ingredients for marination and keep in the freezer for 10 minutes (or you can keep refrigerated for 30 minutes). Now add cornflour and mix well. 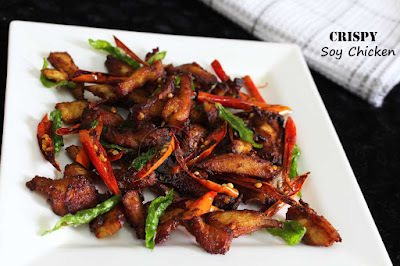 Fry sliced chilies and curry leaves until crisp. Transfer it to plate. Now drop the well-marinated chicken strips one by one. Do not fry over crowded. Fry until both sides turn crispy over a medium flame. Preferably use a non-stick pan for frying. Once done, mix the fried chicken strips with crisply fried curry leaves and chilies. Serve hot. Its damn delicious.